1. Eligibility: The Prop & Peller’s Pretzel Day Giveaway (the “Promotion”) is open only to legal residents of the 50 United States and the District of Columbia (the “Territory”) who are 18 years of age or older and located in the Territory at the time of entry. BC International Trading (“Sponsor”), and their respective parents, subsidiaries and affiliated companies, retailers, sales representatives, dealers, distributors, licensees and the advertising, fulfillment, judging and promotion agencies involved in the development and administration of this Promotion and each of their respective officers, directors, employees, representatives and agents (collectively, “Promotion Parties”), and their immediate family members and persons living in the same households of each (whether related or not) are not eligible to participate. The Promotion is subject to all applicable federal, state and local laws and is void outside the Territory and where prohibited by law. By participating in this Promotion, entrants and their parents or legal guardians if entrants are deemed minors in the jurisdictions in which they reside agree to abide by and be bound by the Official Rules and decisions of the independent Promotion Administrator, which shall be final in all matters relating to the Promotion. If an entrant is a minor, s/he must have the consent of a parent or legal guardian to participate in the Promotion. Sponsor or Administrator may require proof of consent at any time and in any manner they deem appropriate. 2. Promotion Period: The Promotion begins at 12:00 a.m. Eastern Time (“ET”) on April 26, 2017 and ends at 11:59 p.m. ET on May 6th, 2017 (the “Promotion Period”). 3. 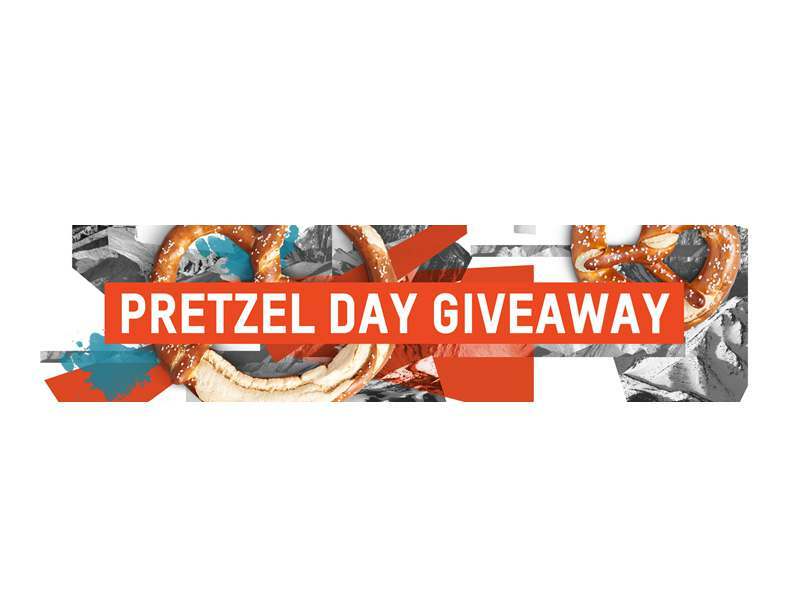 How to Enter: Online Entry: During the Promotion Period, go to propandpeller.com/pretzeldaygiveaway (“Website”) and click on the link to locate the official entry form. Follow the on-screen directions, complete all required fields and submit to enter (“Online Entry”). Entrants must complete all required information. LIMIT ONE (1) ONLINE ENTRY PER PERSON. To the maximum extent permitted by law, all entries become the exclusive property of the Sponsor and will not be acknowledged or returned except as provided herein. You are not a winner until your prize claim is validated and you receive official written notification from the Sponsor or the Promotion Administrator. 4. Prize Drawing: On or about May 7, 2017 the Promotion Administrator will conduct a random drawing from among all eligible Online entries received during the entire Promotion Period. 5. Prizes, Approximate Retail Value (“ARV”) : Five (5) Grand Prizes; Large box with 5 Mega Pretzels, 4 10oz Pretzels, 1 retail pack of pretzel subs, 1 retail pack of pretzel rolls, 1 retail pack of burger buns, 6 coasters, 6 Can Coolers, 1 Men’s t-shirt. (ARV: $100). Twenty (20) 1st Prizes; 1 T-Shirt, 4 Coasters, 2 Can Coolers (ARV: $25). Total ARV of all prizes is $1,000. Prize(s) must be accepted as awarded. All characteristics and features of the prize(s) except as otherwise explicitly stated above are at the Sponsor’s sole and absolute discretion. No substitution, cash redemption or transfer of prize(s) is permitted except at Sponsor’s sole discretion or as provided herein. If a prize, or any portion thereof, cannot be awarded for any reason, Sponsor reserves the right to substitute such prize (or portion thereof) with a prize of equal or greater value. All federal, state and local taxes, and all other costs associated with acceptance or use of the prize(s), are the sole responsibility of the applicable winner(s). Arrangements for delivery of prize(s) will be made after winner validation. LIMIT ONE (1) PRIZE PER PERSON/EMAIL ADDRESS/HOUSEHOLD. If a prize is won by a minor, it will be awarded in the name of the winner’s parent/legal guardian. Odds of winning a prize depend on the number of eligible entries received. Prize(s) will be awarded only to an address within the Territory provided they are claimed properly in accordance with these Official Rules. At the Sponsor’s discretion, unclaimed prize(s) may not be awarded. 6. Entrant Verification: In the event of a dispute regarding the identity of the person submitting an entry, the entry will be declared made by the person in whose name entry was made. The Promotion Administrator reserves the right to require proof of identity and/or eligibility (in a form acceptable to the Promotion Administrator – including, without limitation, government issued photo identification) for any reason the Promotion Administrator deems necessary, in its sole discretion, for the purposes of administering this Promotion in accordance with these Official Rules. Failure to provide such proof to the complete satisfaction of the Promotion Administrator within the timeline specified by the Promotion Administrator may result in disqualification by the Promotion Administrator, in its sole discretion. 7. Disqualification: Entries which are incomplete, incorrect, incomprehensible, not received, or do not otherwise comply with these Official Rules (as determined by the Promotion Administrator in its sole and absolute discretion) will be void and will not be entered into the Promotion’s prize drawing. Entries made by facsimile, overnight courier, automated means, any entry service, or in any other manner not specifically allowed under these Official Rules will not be entered into the Promotion and may result in disqualification of the entries and the responsible entrant(s). Promotion Administrator reserves the right, in its sole and absolute discretion, to disqualify any individual who tampers with or attempts to tamper with the entry process or who acts in a disruptive or unfair manner. 8. Notification & Validation of Winners: Potential winners and/or his/her parent/legal guardian if winner is a minor will each be contacted by telephone, email, regular mail or overnight mail, and may be required to complete, sign and return an affidavit or declaration of eligibility, a liability release, tax forms, and where lawful, a publicity release within a stated amount of time. The return of any notification as undeliverable or failure to respond to notices or return any required documents or information in a timely manner or a determination that a potential winner is ineligible or not in compliance with these Official Rules, as determined by the Promotion Administrator, in its sole and absolute discretion, may result in disqualification of the winner and forfeiture of the corresponding prize, and the choosing of an alternate winner. The Promotion Administrator may, in its sole discretion, provide an alternate skill-testing question or vary the requirements to perform any skill-testing component of the Promotion to accommodate and include the participation of entrants with disabilities. 9. Limitations: Promotion Parties are not responsible for: (i) electronic or digital transmissions, entries or mail that are lost, late, stolen, incomplete, illegible, damaged, garbled, destroyed, misdirected, non-delivered, or not received by Sponsor or Promotion Administrator for any reason; (ii) mail that is received postage-due (iii) any problems or technical malfunctions, errors, omissions, interruptions, deletions, defects, delays in operation of transmission, communication failures (including but not limited to failures or malfunctions of phone lines, mail delivery service, telephone systems or other communications systems), destruction of or unauthorized access to, or alteration of, entries, or for printing, distribution or production errors; (iv) failed or unavailable hardware, network, software or telephone transmissions; (v) damage to entrants’ or any person’s computer; (vi) causes beyond Promotion Parties’ reasonable control that jeopardize the administration, security, fairness, integrity or proper conduct of this Promotion; (vii) incorrect or inaccurate entry information whether caused by entrants or by any of the equipment or programming associated with or utilized in the Promotion; (viii) any typographical or other error in the printing or advertising related to the Promotion, in the administration or execution of the Promotion, or in the announcement/notification of prize winners; (ix) by any human, or other error, which may occur in this Promotion; or (x) cheating or fraud by any participant. All incomplete or non-conforming entries (as determined by the Promotion Administrator in its sole and absolute discretion) will be disqualified. 10. Modification, Suspension and Termination: If for any reason this Promotion cannot be executed as planned, including but not limited to infection by virus, bugs, tampering, unauthorized intervention, fraud, technical failures, social media mandate, or any other causes beyond the control of Sponsor or Promotion Administrator that corrupt or affect the security, administration, integrity, fairness or proper conduct of this Promotion, or if this Promotion is compromised or becomes corrupted in any way, electronically or otherwise, Promotion Administrator reserves the right, in its sole discretion, to void suspect entries/entrants and/or, modify, suspend and/or terminate this Promotion. If the Promotion is terminated before the stated end date of the Promotion Period, the Promotion Administrator may select the winners in a random drawing from among all applicable eligible, non-suspect entries received as of the time/date of termination. 11. Releases: By participating in this Promotion, entrants (and their parents/legal guardians if entrants are minors) agree (and agree to confirm in writing): (a) to the maximum extent permitted by law, that all causes of action arising out of or connected with this Promotion, or any prize awarded, shall be resolved individually, without resort to any form of class action; (b) to release, defend, indemnify and hold harmless Promotion Parties, and their respective successors and assigns from and against any liability, loss, claim or cause of action, including, but not limited to, injury, death or damages arising out of participation in this Promotion or the acceptance, possession, use or misuse of any prize received in this Promotion and (c) to waive all rights to claim punitive, indirect, incidental and consequential damages, attorneys’ fees, court costs, or any damages other than actual out-of-pocket costs incurred to enter, and any and all rights to have damages multiplied or otherwise increased. SOME JURISDICTIONS DO NOT ALLOW THE LIMITATIONS OR EXCLUSION OF LIABILITY FOR INCIDENTAL OR CONSEQUENTIAL DAMAGES, SO APPLICABLE PORTIONS OF THE ABOVE MAY NOT APPLY TO YOU. 12. Publicity: Except where prohibited, participation in the Promotion constitutes each entrant’s (and his/her parent’s/legal guardian’s if entrant is a minor) permission for the Sponsor and its agencies to use entrants’ names, photographs, videos, voices and/or any other likenesses for purposes of advertising and publicity in all media now known or hereinafter invented without territorial or time limitations and without compensation or notice. 14. Choice of Law and Jurisdiction: This Promotion is offered only in the Territory and is governed by the laws of the State of Nevada. By entering, entrants irrevocably consent to the sole and exclusive jurisdiction of the courts of the State of Nevada for any action, suit or proceeding arising out of or relating to this Promotion. 15. Severability & Conflicts: The invalidity or unenforceability of any provision of these Official Rules shall not affect the validity or enforceability of any other provision. In the event that any provision is determined to be invalid or otherwise unenforceable or illegal, these Official Rules shall otherwise remain in effect and shall be construed in accordance with their terms as if the invalid or illegal provision were not contained herein. In the event there is a discrepancy or inconsistency between disclosures or other statements contained in any Promotion-related materials or made by any representative of Sponsor or Promotion Administrator, and the terms and conditions of these Official Rules, these Official Rules shall prevail, govern and control. 16. Winners’ List: To view the winners’ list for this Promotion, please visit https://propandpeller.com/winnerslist. The winners’ list will be available after winner validation has been completed. 17. Sponsor: BC International Trading, Las Vegas, NV. Mail-in entries are not accepted at this address.